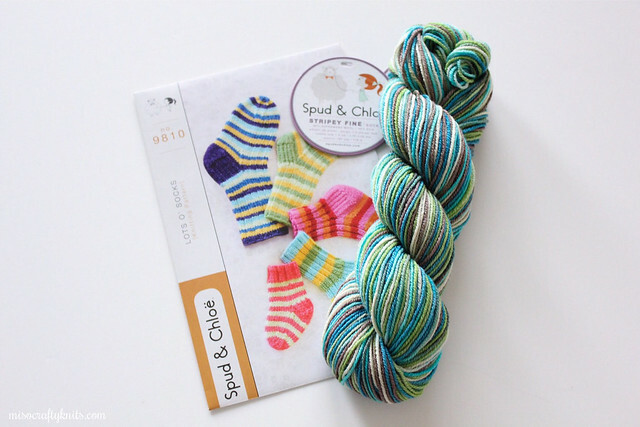 Miso Crafty Knits: Spud & Chloë Stripey Fine :: Review & Giveaway!! 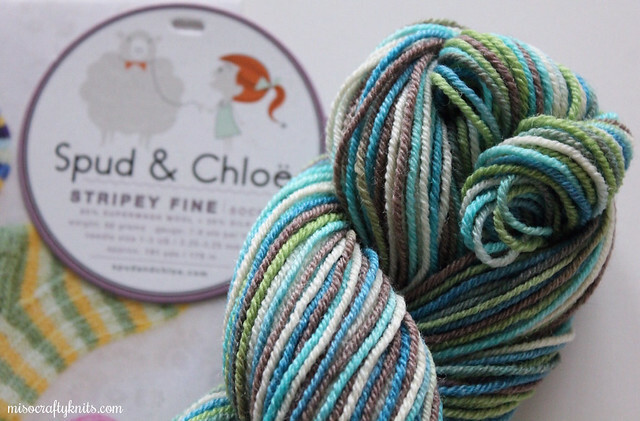 Spud & Chloë Stripey Fine :: Review & Giveaway!! TGIF mes amis!! I know it's been a week since I last posted but what can I say, life's not so crafty when you've got tendinitis in both of your wrists. But I'm happy to report that I've started a weaving project a few days ago and it has been great fun so far. I haven't used my loom in years but I've discovered that weaving is like riding a bike: once I started the process of setting up the warp everything started to feel familiar again and everything fell into place. Even the Mister agreed, since he's usually the one that has to help me wind the warp onto the loom. For those of you who don't weave, as far as I know at least, when doing a direct warping onto a rigid heddle loom there's one person holding the free end of the warp with some tension as a second person winds the other end onto the back apron rod. Technically you can do a solo warp and I've seen video tutorials on how to do that, but I definitely haven't reached that level of weaving confidence yet! There's probably other ways to do a direct wrap but that's as far as my weaving knowledge goes. Anyhoo, guess what? I've also been knitting these past couple of days!! Well...I've only been able to knit for a few minutes here and there but still, I'm knitting! YAY!! Even though the knitting is slow going and it's so hard to put down the needles once you get back into the groove, I really don't want to push or injure myself any further so I have to work hard to limit myself to just a few minutes of knitting at a time. To avoid putting any excessive stress on my wrists I have to refrain from working on any large and heavy projects. Obviously that means no cardigan knitting for me and only knits that can fit entirely in my hand. You know what that means, right? Socks! That there is the yummy Stripey Fine!! If you're familiar with Spud & Chloë yarns and have knit with their Fine yarn before, than you'll be pleased to know that Stripey Fine is made with the same base comprising of 80% superwash wool and 20% silk, and comes in seven fabulous (and deliciously named!!) colourways as pictured above. 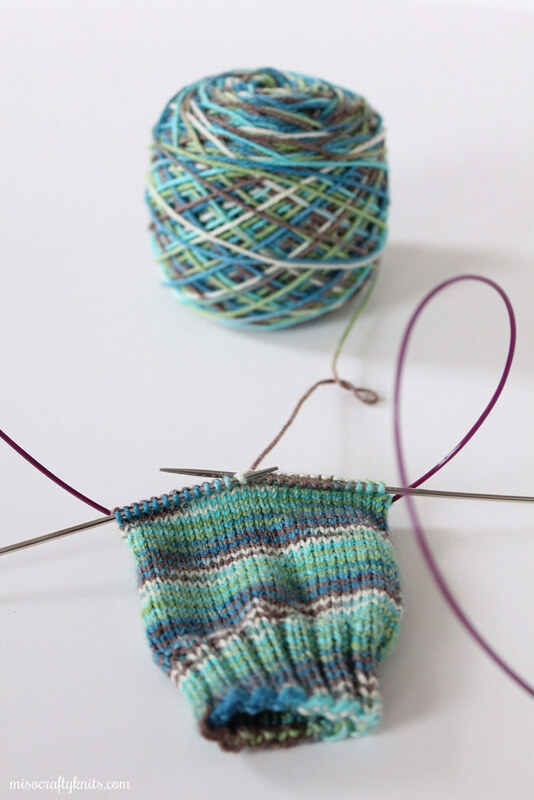 Each variegated colourway is composed from the solid-coloured Fine palette, meaning not only can you mix and match for colourwork, stripes, and whatever other effect you can think of, but you can also find the exact colour(s) needed to create a contrast in your project - like for example the toe, heel, and cuff for socks! Due to the fine gauge and the superwash capabilities, this yarn is perfect for socks, baby knits, shawls, and cowls. Random factoid: both mine and the Mister's favourite ice cream flavour is Mint Chocolate Chip. True story! Anyhoo, due to my wrists I've only managed to knit half of a sock, but it was enough to at least get a feel for the yarn. I've only ever knit with Spud & Chloë Sweater yarn before knitting with the Stripey Fine so from that experience I kind of knew that I was going to be dealing with a standup, quality yarn. Sure enough, before I even cast on the sock I could already tell that this yarn was going to create knit wear that was going to last. From sight alone you can see just how wonderfully round this yarn is and that it would yield excellent stitch definition, especially in lace and texture work. Upon closer examination and a little manhandling, I discovered that the yarn is composed of three strands - each consisting of two plies - all twisted together to form a bouncy (re: so, so squishy!!) and super strong yarn. Yes, even if the Munchkin wore these socks on a daily basis I'm quite positive that he'll outgrow them before any holes could form in the heels or toes! Did I mention that Stripey Fine is also superwash and therefore machine washable? Total bonus. I can't wait to get these socks finished and onto the kiddo's feet. With these rainy, cold, and dreary days that we've been having, these Stripey Fine socks are going to be fantastic when worn with his rain boots! I'm seriously contemplating knitting in an afterthought heel so that I can add length and replace the heel as the Munchkin grows. Even when the leftovers are all gone, I take comfort in knowing that I can always pick up a skein in one of the solids that make up this colourway (in case any one wants to know, Mint Chip consists of: #7804 Cricket, #7814 Shitake, #7806 Calypso, #7805 Anemone, and #7800 Popcorn) and replace the heel or toe as needed. Cool, right? Now, the only thing that might be confusing to some would be the stripey reference in the yarn's name. Depending on your gauge and pattern I suppose you can produce a self-striping effect, like how it is in my sock pictured above. Please don't knit this yarn expecting a true self-striping pattern, it is a variegated. When you take a peek at all the Spud & Chloë colourways you'll see that they're all solids, Stripey Fine is the only yarn in their product lineup that isn't. I just wanted to clarify that. So...would you like to give this yarn and pattern a try? The lovely people at Spud & Chloë gave me an extra skein of Stripey Fine and copy of Lots O' Socks to give away to one lucky reader! If you're too impatient and need to have this yarn in your hands now, good news: Stripey Fine has already made its way to a bunch of yarn shops and if your LYS carries Spud & Chloë they might have it already in stock too (and if your LYS doesn't carry Spud & Chloë there's no harm in asking them to!). And if you've been looking for a sock pattern for your wee ones, here's even better news, use the code "STRIPEY" from February 6 to the 14th (Valentine's Day!) and get 50% off the Lots O' Socks pattern!! Link for the socks here. :: The giveaway is open to everyone!! YAY!! 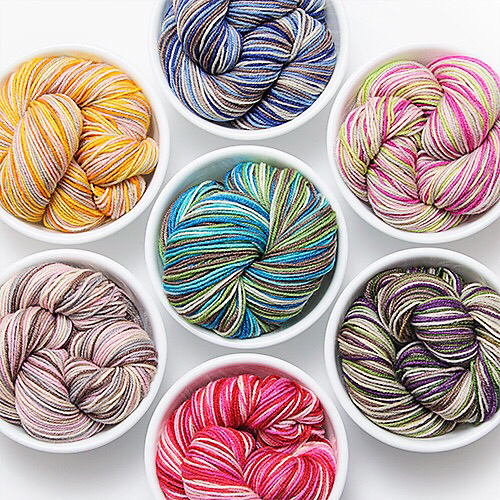 Simply leave a comment below telling me which Stripey Fine colourway is your favourite and what you would knit with it. Don't forget to also include your email or Ravelry ID with your comment! Please note: unmarked photo(s) in this post are by Spud & Chloë and are used with permission. I am not affiliated with the company mentioned in this post. I received no monetary compensation from said company for my review. I was sent a skein of yarn for review purposes and a pattern to knit the yarn with in exchange for posting the review. The opinions I've written are my own and I will not be receiving any commissions from the links provided in this post. I'd love to knit with the Mint Chocolate chip or the Blueberry Cheesecake. Those are all gorgeous colourways! I'd likely be very boring and make a pair of vanilla socks (or mittens if I'm feeling a little cray-cray). Cherry Sundae is my favorite, with Orange Cream a close second. Thanks. Savannagal on Rav. Orange Crush! Although they are all "delicious" looking! Loving the Mint Chocolate Chip :-) I would make either socks or something for my toddler! Mint chocolate chip is my favorite color. I even have some brown fine that I could use for heels and toes if I win. I'm loving the mint chip and cherry sundae colourways... they would make deliciously colourful socks!! Blueberry cheesecake and Neapolitan are calling to me, with mint chip not far behind! I'd knit socks! 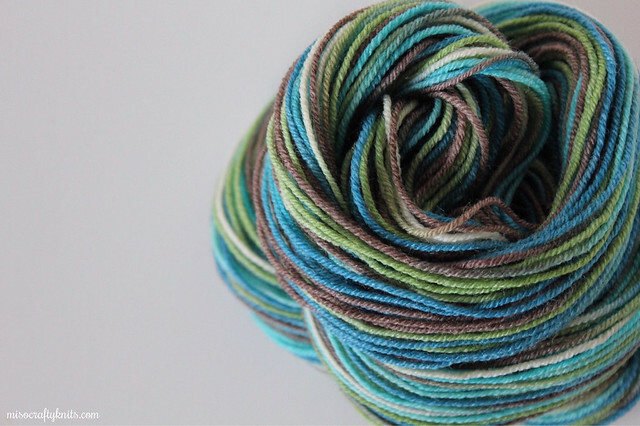 Tutie Fruitie would make a cute pair of socks! TheNekkidSheep on Rav. PS - my first attempt at commenting got eaten when I had to sign in on Google after making it. Kinda irritating. Cherry Sundae is a clear favourite for me, but they're all so nice! Glad to hear your wrists are getting better. Hard for me to choose between Cherry Sundae and Orange Crush. I think I would knit some fingerless gloves with them. I tried to just edit my last post, since I forgot my Revelry name in it. I love the Mint Chip and Neapolitan, which would both make some lovely socks. Wow, they are all beautiful. I think Grape Freeze is my favorite. Thank you for the giveaway! I like the Blueberry Cheesecake and my 3 boys would be fighting over who'd get socks first! I love cherry sundae - I'd probably knit up some mittens. I love the mint chocolate! Such a fun giveaway! Cherry sundae is my favorite and I would knit socks and possible matching mittens for my granddaughter. I think the Mint Chip might be my favorite! I would knit myself a pair of socks. My favorite is Grape Freeze! I would knit socks. Oooh yum, Orange Cream is my fave! meagan(dot)radford(at)gmail(dot)com. Mint Chip and Grape Freeze are tied for my favorite. I'd make myself a pair of gloves with it. Cherry Sundae or mint chip. Definitely a pair of socks or gloves. Would be super fun to knit with two colours in a stripe or pattern sequence......hmmmm interesting?!?! I'm silverfox on Rav.thanks for the giveaway! lots of mice knitted up as toys for my new kittens! Blueberry cheesecake for new mittens. I'm going to jump on the mint chip bandwagon! I love the Mint Chip (although Blueberry Cheesecake is a close second), and I'd knit socks. Probably a fairly plain pattern, as the yarn is the star. Thanks for the giveaway! Mint Chip is my favorite although Grape Freeze is pretty fabulous too! My goodness! These yummy names just made me go raid my refrigerator! My favourite is Cherry sundae and would make a pair of the Airplane socks by Mel Clark. My rav Id is angeleena. My favorite is Mint Chip - such lovely and fun colors! Mint Chip is DEFINITELY my favorite. I would knit some socks with it, and probably get some solid yarn for yummy contrast toes and heels. besharp on Ravelry! I love the Grape Freeze! I'm partial to anything purple. I'm on a big sock kick lately, so it would definitely become a pair of socks for me! My RavID is LisaM87. I love them all but Grape Freeze is my favorite. I would make socks! Cherry Sundae would make a great pair of Valentine's day themed socks! I've wanted to knit a pair forever, and this yarn would make it easy to start! My RavID is rachaelmorag. I like the Blueberry Cheesecake best although the Mint is a very close second. I would like to knit a pair of fingerless gloves out of the yarn. Grape Freeze is my favorite. It would be perfect to help me make my goal of 12 pair of socks this year! Grape Freeze! I'd make some vanilla socks to show off the gorgeous colors. I'm ASchindler on Ravelry. I love blues and greens so Blueberry Cheesecake and Mint would easily get my vote! Thanks for the giveaway. I've often thought of a striped cardigan knitted with self-striping yarn, but honestly I don't think I'd want to bother making sure the stripes started at the same place with each new skein, so I'm unlikely to create such a thing. Socks it is for me, and fingerless mitts would be fun with Stripey Fine too. I love the Mint Chip and Orange Cream colourways the most. The Orange Crush looks pretty cheerful, but I love the Mint Chip colorway. My daughter is going to teach me to make socks using the Magic Loop, so I might try those! I'm really digging the Blueberry Cheesecake and that Grape Freeze! Definitely Cherry Sundae to make socks for my pink obsessed three year old daughter. love love love the Mint Chip (ice cream AND the yarn!) I think Jane Richmond's Climb socks would be awesome or even her Linden Mitts! I think mint chip is my favorite, closely followed by grape freeze. alcbrooks on Ravelry if I should be so lucky. I'd love to make fingerless mitts with mint chocolate chip. lw1977 on ravelry. orange cream is my favourite! would love to knit some spring socks!